Make light work of heavy tasks with our range of KLINGSPOR non-woven web for grinding and finishing. One of the premium brands in the market, AIP offer these for the very lowest possible cost. KLINGSPOR are widely regarded as one of the best manufacturers in the sanding and grinding industry, offering exceptional quality at an affordable price. All KLINGSPOR products have been subjected to rigorous safety testing and their non-woven web has passed the European regulations required. 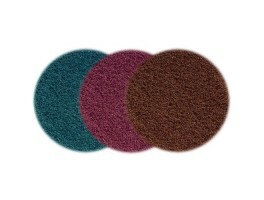 Heavy duty non-woven hand pads come in a convenient pack of 10 and are sturdy and long-lasting. These can be used as a substitute for wire wool in a variety of applications such as cleaning, polishing or removing rust. Each of these pads is available in a range of finishes including 80, 320 or 800 grit providing strength and superfine finish in varying degrees. AIP also stock non-woven web discs which can be used for stainless steel and metals. A high edge stability ensures an excellent shelf life with an outstanding performance that’s guaranteed to impress. 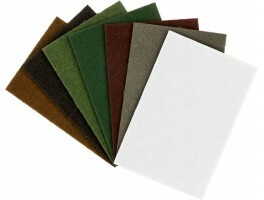 Before use, these non-woven web pads should be backed by special backing pads, for the ultimate safety and result. Whenever you use sanding or grinding equipment, it’s advisable to follow all of the instructions for use, paying special attention to cautions and safety. AIP sells a variety of safety equipment which you can find listed under the appropriate sections. If you need any more information about our KLINGSPOR non-woven pads, please give us a call for help and advice.